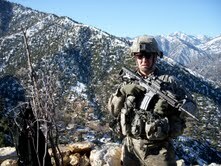 I was laying prone on the rocky ground, something I hardly ever did in Afghanistan. My heart pounded so loudly I thought it would break through my chest. I had never been more nervous. I feared for my life. I was sitting at the rocky outcrop on the southern part of the Korengal Outpost, the KOP. Taliban swarmed up the hillside, surrounding me. The men who were with me fell back; I couldn't stem the retreat. I knew at that moment I would die on that hill. And then I woke up, alone in my apartment in Vicenza, Italy. It was the worst nightmare I'd ever had. In my dream, I had returned to the Korengal Valley, later nicknamed the "Valley of Death." I only spent a couple months in the Korengal, but it felt much longer. The place haunted me before I arrived in Afghanistan; it still haunts me. All these memories came back when I saw the photos of the Korengal Valley last week. Instead of US forces fighting for the population, it is now controlled by the insurgents I fought against. The US Army, under General McChrystal, decided to move all troops out of the Korengal last week. If I am being intellectually honest, it makes sense from a counter-insurgency perspective. But while I can understand the move rationally, emotionally it just feels wrong. I first heard about the Korengal Valley through this Nightline piece by Sebastian Junger. I watched it in Vicenza, Italy a few days before I left for Afghanistan. This footage made the war very real, and very sudden. Sebastian Junger's recent New York Times OpEd is probably the most thoughtful of the accounts about our retreat/retrograde/draw-down in the Korengal. For the best images, this photo gallery by Time captures the essence of the valley very well. It was taken after Battle Company and the ROCK had left Afghanistan, but the people are still the same. Finally, Jeff Schneider captures the fundamental conundrum of the Korengal in this piece for the Huffington Post. Sorry all. We had a sick as picture but it wouldn’t come thought. I’ll try to post it larger later. Nice picture Michael. Thanks for the links. Hey its been awhile, I´m sorry I missed meeting up with one of you while I was in LA briefly. I know its hard to accept the idea that what you once put your life on the line for may have been in vain, but its not a complete waste if there is somebody out there who has learned something learned from it and acts upon what they have learned in a way that can save or improve lives. I´m kind of confused about the urban concentrated population centric approach to Afghanistan people keep talking about. My uninformed gut feeling is that the people in Urban areas in Afghanistan tend to be a bit more metropolitan (by Afghani standards), while the rural areas tend to be the stronghold of the kind of militancy and idealism that is strongly opposed to US military presence. Just like the US, or Germany, or Iraq rural areas tend to be more religious and more conservative, hence the best place for insurgent strongholds. In Korengal as you linked there are other things going as well like the lumber trade but I would guess that Korengal´s location close to the Pakistani border, the lumber trade problems, and the mindset of the local more traditional rural inhabitants all combined to make controlling that area something of a Sisyphean task.